My first book Out of Control was not widely reviewed. I was an unknown first-time author. My huge sprawling book was too big to scan quickly and frustrating to summarize. It got only a very few mentions in the press. Some friends wrote blurbs for it, but that was all for publicity. The book also debuted at a very hectic time right after the launch of Wired, when I and the whole world were running dizzy at internet speed. 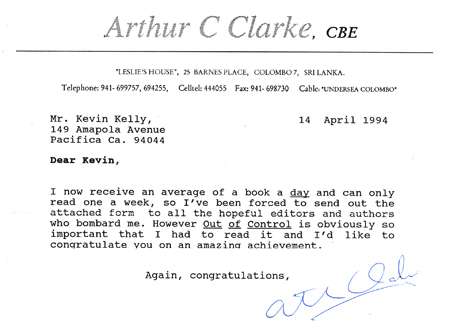 Science fiction legend Aruthur C. Clarke was, naturally, a boyhood hero. What kid was not impressed by his imagination and scientific sensibilities? I sent him a manuscript not expecting any reply. He simply was the smartest author I could think of. Sometime during the Wired startup chaos, I got a letter from Clarke, which included a standard form stating his inability to blurb books. I received his note just after the book reached bookstores. I put it aside in a pile of papers on my very messy Wired desk and somehow forgot about it. When I left Wired in 1999, I dumped all my papers into a box, which I finally got around to cleaning out from the garage last weekend. Somehow I had not noticed his letter (I think I focused on his form letter) and while reading it this time I found a blurb for Out of Control that I don’t remember seeing before. “An amazing achievement.” — Arthur C. Clarke. I’ll take that one! Wish I had used it back then. Clarke was exactly the kind of person I want to write for. Someone who reads a lot, knows a lot, is easily bored, and wants to hear something new. His praise means a lot. I’ll keep aiming high.